…and the NYPD isn’t helping. Given the Bowery’s proximity to the site of New York’s most recent bike-related tragedy, the death of Jeffrey Axelrod, and the fact that the Bowery intersects one of the city’s most dangerous streets, it’s amazing to me that the DOT still hasn’t done anything to make this detour safer. 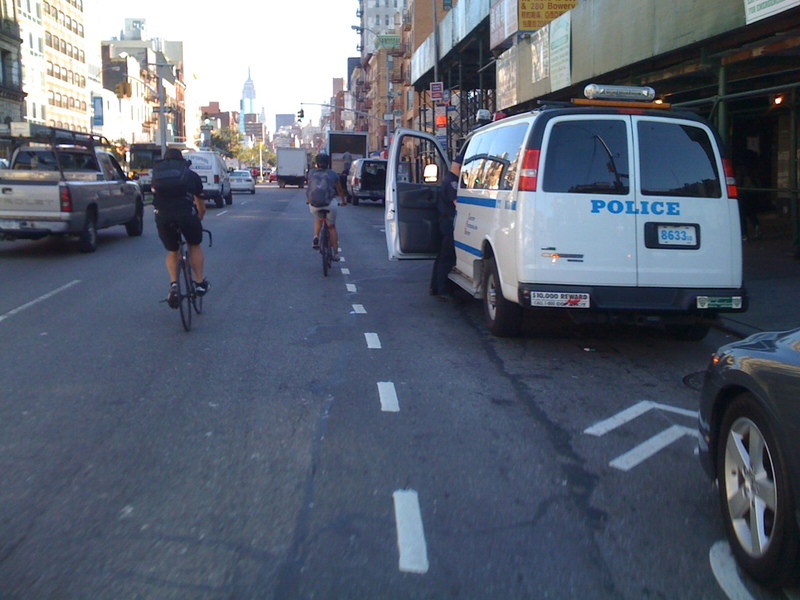 Unfortunately, there has been too much focus on what’s happening on the Manhattan Bridge and not enough on what’s happening when cyclists get off of it. I am still hoping that the DOT figures out a way to make this temporary detour safer for the many cyclists who, for many reasons, aren’t finding ways to avoid this death-trap. I think that it is time for publications such as this to offer solutions to this problem. There is no easy solution to this detour but if a constructive idea was put forth I am sure that DOT would listen. Behind the scenes, I and other volunteers and activists have talked to people at DOT and with the bridge project liaison about ways to make this safer. The mirror on the Brooklyn side of the bridge was installed due to input the DOT received from various channels. I’m not sure if a conversation I had with someone at DOT helped get it installed, but I’m sure it didn’t hurt. The people I have spoken with have been receptive and sympathetic, although there are still no big solutions to the biggest problems this detour is causing. We are discussing many more potential solutions at tonight’s TA Brooklyn Volunteer Committee meeting. Please come!